Yes, I know the title sounds a bit absurd out of context, but bear with me. There’s this view that seems to be growing more popular as the years go on. It essentially states that Severus Snape should not be regarded as a good guy because his intentions for keeping Harry Potter alive weren’t really good ones. In honor of the late Alan Rickman, who brought the character to life, I want to explore that theory, and why I staunchly oppose it. The argument that people make about Severus Snape is that because he never actually cared about Harry, or about the greater conflict between the wizarding world and Voldemort, or about pretty much anyone other than Lily Potter, he should not be hailed as a hero in the context of the story. This idea is understandable. Snape made Harry’s life a living hell while he was at Hogwarts, and while some might say it was to hide the fact he was working for Dumbledore all along, it’s still a jerk move. However, many who hold this idea go so far as to say that Harry should never have named his kid after Snape because even though Snape might have been brave, he was still a whiny jerk who treated everyone like garbage because he didn’t get what he wanted. That’s always struck me as bit absurd, because while Snape’s intentions for keeping Harry alive were never really good ones, they don’t really matter. 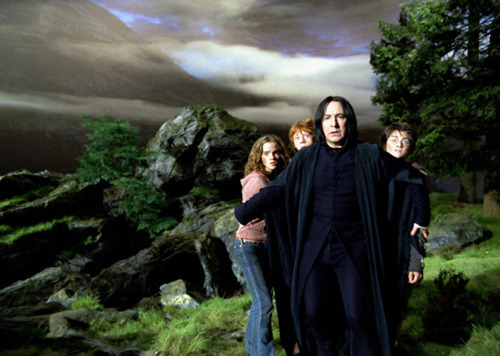 A case can be made that Severus Snape was not a good man at his core. I won’t deny that. But that doesn’t diminish the fact that he might be the most important character of the series. Just before Harry Potter jumps into Snape’s memories and discovers the truth about his allegiance, he finds himself at the darkest point in his life. His friends are dying, the place that has been a home to him for years is under attack and he’s still a long way away from killing Voldemort, which is the only way he can end the suffering. As all of this is happening, he watches Snape die. And then he learns everything about him. Harry learns about Snape’s loyalty to Dumbledore, his love for his mother and how long he’s dealt with Voldemort to protect Harry. Good intentions or not, Snape did all of these things out of love. In Harry’s darkest moment, he discovers that the man he thought to personify evil (even before he knew Voldemort) was capable of undying love. In the midst of all the pain, one of the grimmest parts of Harry’s was revealed to be a source of light. That’s why he named his child after Severus Snape. That probably even helped Harry muster up the courage to turn himself over to Voldemort. If the man he’d hated all his life could perform feats of extreme bravery, then so could he. Severus Snape was written as a shade of darkness, and when he was revealed to be acting under the influence of immensely powerful love, he became a metaphor for the entirety of the Harry Potter franchise. Even in the darkest times, love prevails.